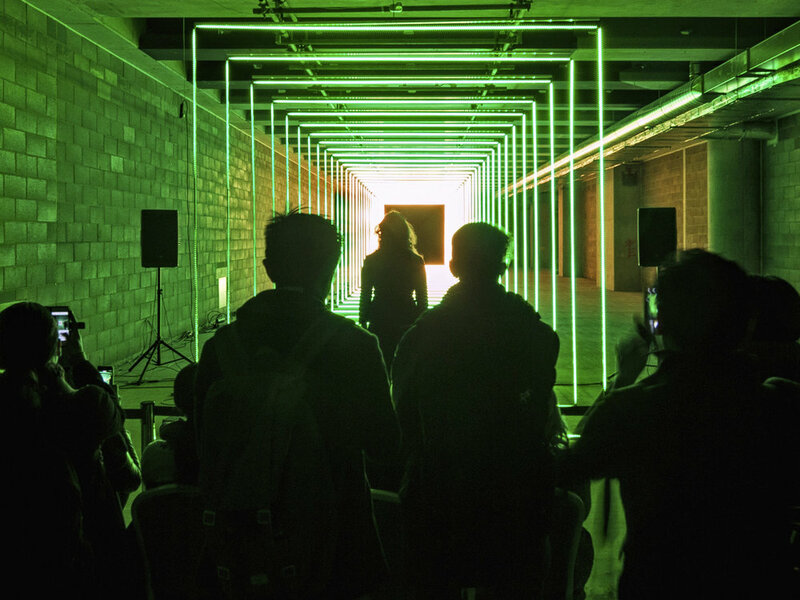 Crossing the arts-science divide, this large-scale interactive light and sound installation was extremely popular with visitors as it was both reactive and immersive. A unique experience, it made an impact on participants’ emotions and well-being. Using a high-powered laser the installation was controlled by an individual’s mind, via an EEG headset. As thought patterns changed, the electrical data from the brain was used to control the music and created an intricate light experience. Participants were encouraged to use their level of mental focus to control the installation. When concentrating on one thought, the music got higher in pitch and the light patterns become faster, whiter and more intense. As their thoughts scattered, the music became lower in pitch and the light patterns became slower. In this way, thoughts were transformed into architectural-size gestures for an on-looking audience. Commissioned and produced by Illuminate Productions, in partnership with Better Bankside and Tate Modern. Kindly supported by Arts Council England, ER Productions, Brogan Scaffolding, Network Rail, Ramboll and Neurosky. Awards The project won 1st place award for Innovation Application, in the entertainment industries International Laser Display Awards in 2015. Key coverage total reach 900 million. Media included: BBC Click, London Live, BBC Radio Robert Elms, The Times, The Telegraph, Daily Mail, The Guardian, Time Out, Financial Times and Evening Standard. The original project was developed and adapted for a new site, this time it featured more than 30,000 illuminating LED lights. It was attended by 5000 people per day and due to popularity was re-commissioned the following year. Awards Voted best lighting event in the Darc Awards 2017. Commissioned by the Canary Wharf Group for its annual Winter Lights Festival. Produced by Illuminate Productions, supported by Brogan Group. Marcus has created experimental film and interactive projects for the last 20 years. Starting with live film shows during the heady days of rave, he moved on to specialise in making visuals for large-scale concerts. He now works on a range of moving-image projects, from award-winning stage visuals for The Chemical Brothers, to Metallica's feature film and directing a commercial starring Lionel Messi. He has created a number of artworks, which have been exhibited at galleries including The ICA, National Gallery of Australia, Seoul Museum of Modern Art and the Science Museum, London. A music composer and sound designer, Rob makes music behave in unusual ways, often reacting or adapting itself to the listener’s mood or situation. He is currently working on music which adapts to user behaviour and data to help people understand how to exercise better, meditate better or live a healthier lifestyle. In August 2014 he worked with Artists & Engineers and Atmos Studio to create a 3d ambisonic soundscape for Arboreal Lightning – a large scale interactive LED tree installation at the heart of Imogen Heap’s Reverb festival. Alex is a designer and technologist who develops hybrid projects for advertising, film, digital and live event industries. Starting his career as a creative technologist at a pioneering projection mapping studio The Darkroom, Alex now specialises in building bespoke production pipelines that combine a variety of mediums, data and outputs - from generative visuals and LED design to mobile apps and the web. He also runs a boutique investment company which helps fund early stage UK-based startups. This installation is a further adaptation of On Your Wavelength site-specific for The Victoria Hall in Leeds Town Hall, as part of Leeds Light Night in October 2017. The sound was played through the pipe organ in the hall, with the light changing with every note played. The participant controlled the lighting like a conductor, with the lights arranged on the circular, to resemble a ‘choir’. Intense beams of light radiated out into the space when thoughts were unfocused, as participants gained focus, the beams gathered towards them.